Puerto Rico is getting a version of Chapter 9 – but it’s only chapter 1 in the U.S. territory’s rehabilitation. The Senate late on Wednesday passed a bill that provides legal breathing space to restructure $70 billion or so of debt, analogous to the bankruptcy protection process available to U.S. municipalities. The measure is headed to President Barack Obama’s desk. Puerto Rico should get breathing room, but it may need a lot more help to get its economy back on track. The restructuring authority – granted by Congress in return for federal oversight of its budget and finances – probably won’t stop Puerto Rico defaulting on $1.9 billion of debt payments due on July 1. But it will shelter the island from a barrage of lawsuits and ensure it can provide basic government services while it negotiates with creditors. U.S. lawmakers may be called upon again. For one thing, Puerto Rico is facing a worsening healthcare crisis. The territory receives far less federal funding for Medicare, Medicaid, and other health programs than U.S. states. Along with a decade-long recession, that has left the healthcare system ill-equipped to provide basic care, much less deal with an outbreak of Zika virus that’s sweeping the island. Without more funding, there’s a risk that the exodus of Puerto Ricans to the U.S. mainland will continue, perpetuating the island’s economic downward spiral. Second, while the bill passed on Wednesday included some business-friendly provisions, including potential cuts to the minimum wage for younger workers, there was little in the way of direct economic stimulus. With more than 46 percent of the 3.5 million Puerto Ricans already living below the poverty line and the unemployment rate stuck at around 12 percent, more than double the rate on the U.S. mainland, it may take serious cash and tax breaks – on top of any debt relief – to get the economy growing again. The fact that dysfunctional Washington lawmakers have agreed on anything useful in the runup to a presidential election is a minor miracle. But Wednesday’s bill is only one step in a long journey back from the brink for Puerto Rico. 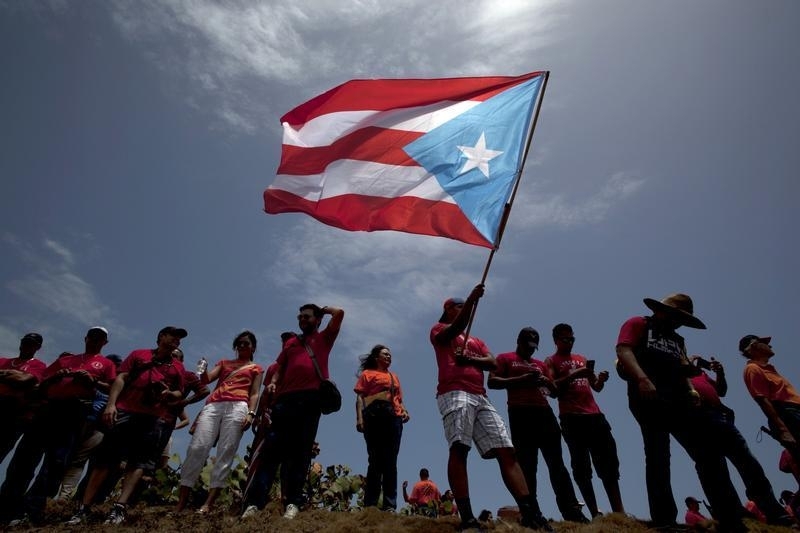 A man waves a national flag as others stand nearby during a protest in San Juan May 13, 2015. The U.S. Senate on June 29 approved a bill that will allow Puerto Rico to restructure roughly $70 billion of debt in return for accepting involvement by a federal oversight board. The U.S. territory, whose economy has been in recession since 2006, is expected to default on $1.9 billion of debt payments due on July 1. The measure, which halts litigation against the issuers of Puerto Rico's government and quasi-government debt to allow an orderly restructuring process, passed the Senate on a vote of 68-30.